I love Pinterest, who doesn't? There are so many reasons I love Pinterest, but one of them is the amount of great ideas I find on there to keep the two toddlers in my life busy. 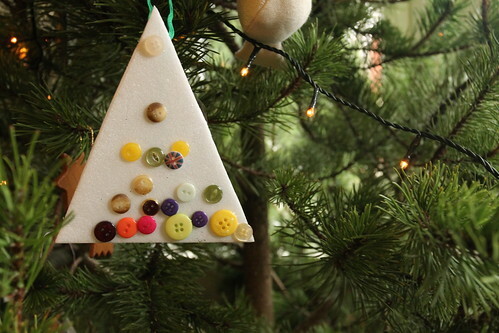 I spotted this simple idea for tree decorations the other day; triangles of polystyrene, with buttons glued on and a ribbon for hanging. I have a whole stack of polystyrene sheets that I use for printing, and of course plenty of buttons and ribbon scraps. Both boys enjoyed this project. 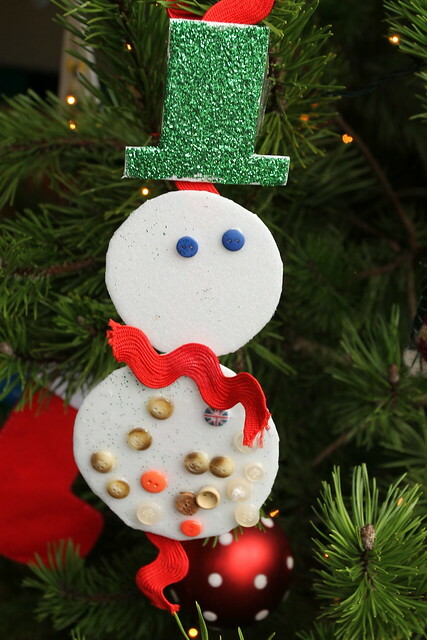 Ernest particularly enjoys using glue, his trees took rather a long time to dry! 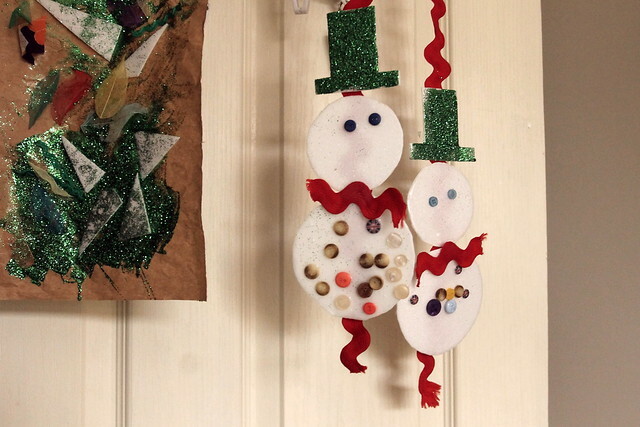 Inspired by this idea, I cut out two circles for the boys to make snowmen in a similar way. 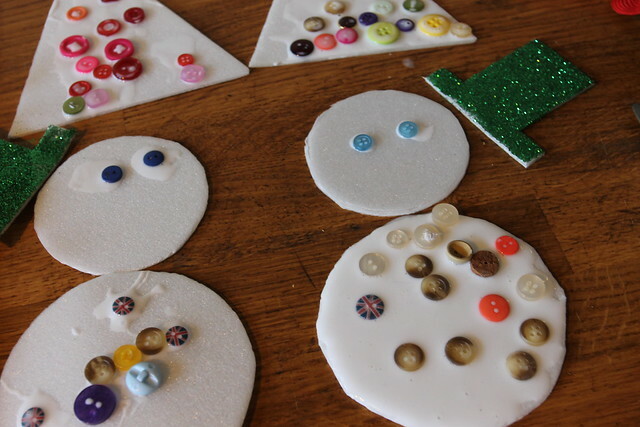 I also cut out two simple top hats which we had fun covering in glitter. After the snowmen were dry, I added a strip of ribbon to the back with sticky tape, and a small piece of ribbon for a scarf with a blob of glue. 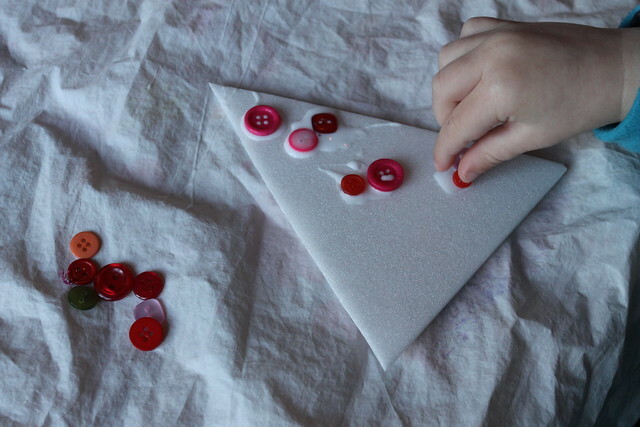 A quick, simple, but effective toddler make, with only a little help from me adding the final touches. Ernest's is hanging on the tree very happily. These are so so sweet. Happy Christmas.